The latest nuclear missile provocation came in the dark, with an unbeastly roar that pierced the chilly coastal fog in the wee hours of February 25. A shimmering light rose above the clouds and arched over the Pacific Ocean, the incomparable threat to distant enemies reaffirmed. Witnessing the latest midnight test flight of a first-strike Minuteman III intercontinental ballistic missile from the gate of Vandenberg Air Force Base was a group of nearly 100 demonstrators, the largest nuclear missile launch protest there in nearly 30 years. Fifteen members of the group crossed from the designated protest area onto base property, where they were arrested for trespassing. I was invited to jump on a bus called the Green Tortoise this past Friday (Feb 24) to travel down to Vandenberg AFB in central California to protest the test launch of an ICBM missile. 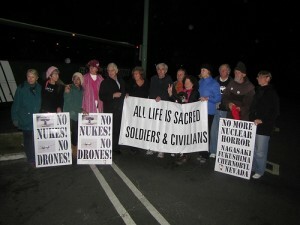 The bus originated in Oakland and we stopped in San Jose and Salinas on the way down to pick up more anti-nuke/pro-humanity activists and met dozens of others who were already near the entry of the base at about 11:30pm. The “launch window” was open from 2am to 8am on the 25th. The missile was destined to come down about 25 minutes after launch in the Marshall Islands. According to one of the organizers of the event and long time anti-nuke protester at Vandenberg, MacGregor Eddy, the combination of the missile launch and missile cost US taxpayers 28 million dollars. Needless to say the potential loss of life in a nuclear holocaust is mind numbing. As heroic legend, Daniel Ellsberg said at the rally before the launch: “this is only one missile being launched, can you imagine hundreds, or thousands, of missiles being launched and it being the last thing humanity sees?” The US Military Industrial Complex has poisoned the Marshall Islands for generations, and this missile was just another drop in their nuclear slop bucket. As stated, Daniel Ellsberg was there at the protest, along with long time launch opponent, Fr. Louis Vitale, who figured he has been arrested 108 times at Vandenberg (to add to his opposition to the School of Assassins, where he has been arrested and spent significant time in prison). After the short rally, I jumped at the chance to cross the actual line with them that separates real America from Vandenberg AFB where dozens of MPs awaited this “trespassing” by about 17 protesters. The sound of a Minute Man 3 missile being launched is the sound of abject tyranny. It’s the sound of the tortured screams of the Japanese being incinerated in their beds or slowly poisoned to death by deadly radiation exposure. It’s the sound of a child whimpering with pain in Basra, Iraq, because she contracted leukemia or another cancerous condition due to the US’s use of depleted uranium in her country. It’s also the sound of her doctor crying with frustration because he can’t treat her properly due to the lack of medicine or other treatments available to him. It’s the sound of dirt being shoveled for her grave and the tortured cries of her parents. The sound of a Minute Man 3 missile being fired is the sound of silence ringing in the halls of many schools that are forced to close doors because of the absolute fealty this nation pays to the military industrial complex. As one of my contacts said, it’s like firing an elementary school into space. This absolute fealty to the industry of death and destruction will inevitably lead to the sound of the collapse of Empire. The collapse of Empire will sound like armageddon to some, but will be music to the ears of others. The Green Tortoise left Vandenberg at about 4am filled with three-dozen tired, but happy protesters. We napped, we sang, we talked on the seven hour trip home. It was the sound of anger, frustration, and sorrow, but it was also the sound of resolve and success. I firmly believe that our, for lack of a better term, “witness” at the event had a profound impact on at least one of the MPs, and who knows who else? And people wonder why I don’t pay federal income taxes? We detainees were cited and released, but we will be forced soon to travel down to Santa Barbara soon to be arraigned. Some will plead, “guilty” and pay a fine anywhere from $250 to as high as $5000—mostly because going to Santa Barbara is a huge inconvenience. This struggle began a long time ago when physicist Albert Einstein founded the world’s first anti-nuke organization and it continues. I know at least for myself and Daniel Ellsberg and a few others, we will plead, “Hell no, not guilty,” and fight the higher crime of nuclear weapons.